Arthur Christmas (James McAvoy) is the second in line to Santa’s red suit; he is Santa’s second son, but knows that even though he loves the season, and takes painstaking care over replying to children’s letters, that he will probably never ascend to the ‘throne’. Arthur’s brother Steve (Hugh Laurie) is everything that his clumsy but well-meaning brother is not, but when a child is missed on Christmas Eve, only Arthur is determined to deliver the gift, no matter what. The Christmas movie is something that has somewhat fallen out of popularity of late, but this year we are being treated to A Very Harold and Kumar Christmas (ahem) and Arthur Christmas. The story is one that children can relate to, there is always the fear that Santa is going to miss out on you because he has so much to do in one night, but it also has a theme for adults; remember those days when analogue was the way to go? Well so does Arthur. Traditional values make a strong comeback in this film when Arthur ‘borrows’ an old sleigh used by his Grandsanta (Bill Nighy) to race across the sky and deliver the final Christmas present. That said, however, the new technology angle taken by the film is entertaining; the elves get into children’s homes, Mission: Impossible style and deliver presents in the blink of an eye. The problem is that Santa has very little to do with the whole process now. That’s where Arthur comes in. The voice talent in Arthur Christmas reads like a who’s who of English talent; James McAvoy as Arthur, Hugh Laurie as Steve, Bill Nighy as Grandsanta and Jim Broadbent as Santa. All do a fine job, but Bill Nighy’s Grandsanta is hilarious as the man who believes that Christmas should go back to it’s roots. The elves deserve a mention as well; they are oddly reminiscent of the minions on Despicable Me; their adoration of the man in the red suit, and over the top reactions are brilliant. It is strange to see Aardman Studios – those lovely people who brought us Wallace and Gromit – do a CG animated film, and while they are not Pixar (the cry that seems to go out every time a CG film is released) they do a fine job. The film looks great and is gorgeously realised, but as well as this, it steers clear of cliché; there is no real villain and no love interest but it is only afterwards that the audience realises this. Arthur loves his job and Christmas and it is this – as well as the scrapes the gang get into – and a little bit of magic that keep the film fresh. 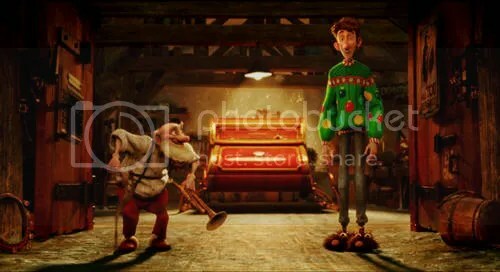 Arthur Christmas is charming and filled with wonder. Children will love the attention that goes into Santa’s work, and adults may just remember the little spark of magic that makes Christmas special.